Our little yoga oasis on the island of Gods as Balinese lovingly refer to their home, is a place we have been coming back to for years. It has something extremely special about it, something that needs to be experienced to be comprehended. It is easy to feel truly blessed and cared for in this simple and beautiful place. 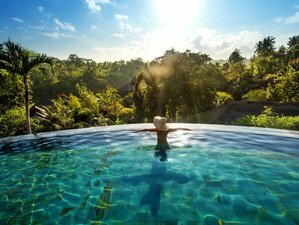 Let yourself rest and immerse into the sweet essence and healing energy of the island, nourish yourself with sun ripened fruits, delicious spa treatments, the ocean and the mountains, as you deepen your yoga and meditation practice. We can’t wait to welcome you here. You will be accommodated in beautiful rooms in the guesthouse and 6 Balinese style bungalows that are located throughout the mountain retreat. The rooms and the bungalows are lovingly furnished and surrounded by blossoming gardens. The water at the centre is untreated, and comes from a natural spring. The swimming pool is a saltwater pool. The organic gardens produce delicious vegetables and a variety of fruits. You can spend many hours on our dining terrace reading, relaxing or having their meals. The terrace has an open view over the valley and the ocean and is shaded by fruit trees and bamboo. At the terrace, you can freely help themselves to mineral water, green and herbal teas throughout the day. Friendly staff are available should you wish to order fresh pressed fruit- and vegetable juices, lassies, and healing herbal drinks. This yoga retreat is an invitation to deepen your understanding of yoga and meditation, whether you are new to yoga or an experienced practitioner. Yoga retreat is a holiday that nourishes you on many different levels - physical, mental and emotional, recharging you and helping to attune to the vibration of radiant health. Daily yoga and meditation classes during the retreat create a great foundation for consistent and joyful practice and help you feel more open, strong and balanced. This yoga retreat will offer a variety of yoga practices: asana (postures), pranayama (breathing techniques), meditation, kriyas (cleansing practices) as well as myofascial release sessions and yoga Nidra deep relaxation. The classes will be offered in a variety of styles from deep yin yoga, classic hatha to more dynamic and challenging vinyasa flow. This retreat is suitable for all levels of practitioners from beginner to experienced, however it is essential that in the months leading up to the retreat, you have a regular yoga (asana) and meditation practice at least 2x per week to be able to follow the classes and get the most out of the retreat. Elena Mironov is a Zürich-based international yoga and meditation teacher, author, and composer. Over the past 16 years, she has led over 60 yoga and meditation retreats in Europe, Africa, Asia, Iceland, and Central America. She released a yoga DVD that has received brilliant reviews by leading yoga publications like Yoga Journal Deutschland, OM Yoga Magazine UK, Wellbeing, and Australian Yoga Life. Her classes are characterized by playfulness, uplifting, and warmth and are focused on safe alignment, breath initiated movement, and the experience of flow. Most of the ingredients are from the centre’s organic gardens, the freshest sun ripened fruits and vegetables rich in prana. We will be served a delicious vegetarian menu and on the last evening we will have a festive dinner together. You are responsible for organizing your own transport to Bali. It’s recommended to book the flights to Denpasar airport Ngurah Rai (DPS). The center is about 2.5-3 hours drive from the airport. Transfers can be organized beforehand at 78 EUR one way and can be shared between up to 3 participants sharing a car. The retreat center will assist you in that. You will receive all the information and contact details when you register. Airport: Ngurah Rai International Airport Airport transfer available: Ngurah Rai International Airport (US$87 per person) Additional charges may apply. You can request this in the next step. Sparkling Yoga offers world-class yoga retreats led by highly experienced teachers. Their retreats are created to ensure guests are supported, nourished, and inspired throughout their yoga journey.